Gigantic crater discovered hiding under Greenland ice is bigger than Washington, D.C. It's also the first crater ever found under a continental ice sheet. An international team of researchers say they've discovered an impact crater of vast proportions hiding beneath more than a half-mile of ice in Greenland. More than 19 miles wide and about 1,000 feet deep, the huge bowl-shaped depression is bigger than Washington, D.C., and one of the 25 biggest craters ever discovered on Earth. It's also the first crater to have been discovered under a continental ice sheet. 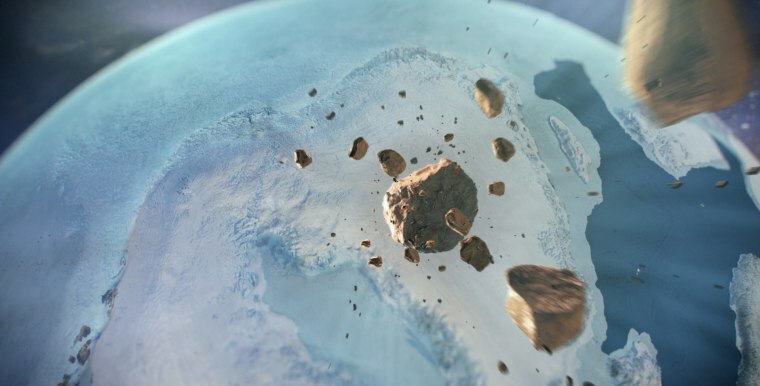 The crater formed when a meteorite more than half a mile wide smashed into an area that is now covered by the Hiawatha Glacier in northwestern Greenland, the researchers say in a paper describing their discovery. The researchers can't pinpoint the age of the crater. But its well-preserved condition suggests that it formed "after ice began to cover Greenland, so younger than three million years old and possibly as recently as 12,000 years ago," Kurt Kjaer, a professor at the Center for GeoGenetics at the Natural History Museum of Denmark in Copenhagen and the leader of the team, said in a written statement. Whatever the age of the crater, its discovery serves as a reminder that Earth still has a few secrets up its sleeve. "There is still so much more about our landscape that we have yet to understand," said Joe MacGregor, a glaciologist at NASA's Goddard Space Flight Center in Greenbelt, Maryland, and a member of the scientific team. "That's particularly true of the polar regions because so much is covered by ice." What's the difference between a comet and an asteroid? The researchers first spotted evidence of the crater in 2015 when they noticed an unusual feature on a topographical map made from data obtained by NASA aircraft that had surveyed the area with ice-penetrating radar. They spent the next three years confirming the discovery, using satellite imagery and additional aerial surveys made with a newer, more advanced radar system. "Radar sounding of ice sheets is a decades-old technology now, but the system we used to study Hiawatha Glacier is the most sophisticated yet deployed to survey a glacier," MacGregor told NBC News MACH in an email. In their final step to confirm the discovery, the scientists visited the area in 2016 and 2017 to collect samples of sediments that had washed out from under the glacier. The samples included bits of quartz with internal structures that were deformed by intense pressure. This so-called shocked quartz has been found in other impact craters as well as in areas where underground nuclear tests have been conducted. Its presence helped convince the researchers that the strange feature on the map really was an impact crater. Other scientists want more evidence. “I can say what they are presenting as shock quartz is definitely shock quartz,” Ludovic Ferriere, an impact crater expert at the Natural History Museum in Vienna, told National Geographic. "I think they have something here," he added, "but they make strong conclusions based on very preliminary data." Clark Chapman, a retired planetary scientist at the Southwest Research Institute in Boulder, Colorado, expressed similar skepticism. He said in an email that while it was "plausible that the feature is an impact crater," it was hard to tell for sure because the landform is buried so deep beneath the ice and can't be directly reached. In response to the criticism, MacGregor said the researchers hope to return to the area to conduct additional research but acknowledged the difficulty of drilling through the ice and into the underlying bedrock to obtain more evidence. That would be a difficult process that could take several years, he said. But he said the existing evidence was sufficient and that — given the shape of the geologic feature under the ice and the sediment samples recovered nearby — there was only a "very slim" chance that the feature under the ice is not an impact crater. "The simplest explanation of our observations is that the glacier overlies an impact crater," he said. WANT MORE STORIES ABOUT METEORITES AND ASTEROIDS?